"Morning Bird Don't moan Don't cry" by Homay, performed at the Music Center at Strathmore, part of Washington DC concert on September 25, 2009. Don't ruin the rest of our life ! Punch the oppressors in the mouth ! Don't forgive their crimes ! Performed by Homay and the Mastan Group at Music Center at Strathmore, part of Washington DC concert on September 25, 2009. The highly acclaimed Iranian musical phenomena, Homay and The Mastan Ensemble return to the Walt Disney Concert Hall on August 16, 2009 at 7 p.m. to perform another exceptional collection of the latest compositions by Homay, with symphony arrangement by Maestro Shardad Rohani. During the first part of this program, the Ensemble will perform an operetta, written by Homay, inspired from the story of ‘Moses and The Shepherd’ by Rumi (Mowlana) written in Aarefan e Raaz by Dr. Mahmoodi Bakhtiari. The part of ‘Moses’ will be performed by the well-known and talented Iranian singer, Soley Vaseghi, ‘The Shepherd’ by Homay and the third character, ‘Raavi’ or ‘The Storyteller’ by the published author and award-winning journalist, Homa Sarshar. The operetta will be followed by several masterpieces by Maestro Rohani. In part two of this concert, the latest compositions by Homay and Maestro Rohani will be performed by the Ensemble. Since early 2009, Parvaz Homay has been banned by the Iranian government officials to perform any of his musical pieces publically in Iran. This is especially difficult for Homay, since he is a true patriot to his motherland Iran and its people and lives through his music. One of his latest compositions is a very special piece called “Sarzamin e Be Karan” or “Boundless Land”, with symphony arrangement by Maestro Rohani, dedicated to the people of Iran. 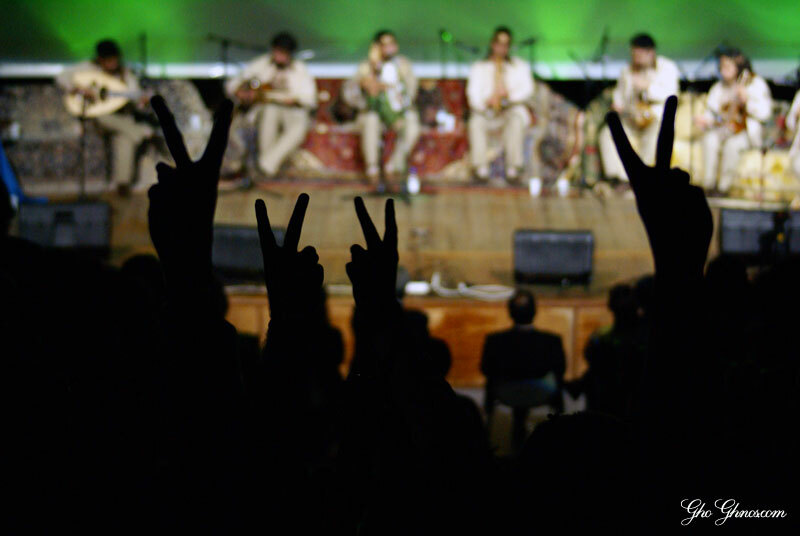 The August 16th performance at the Walt Disney Concert Hall will be his first public concert since The Mastan Ensemble’s final concert series in Homay’s hometown in northern Iran, which took place during eight consecutive sold-out evenings, attended by their devoted local Iranian fans, consisting of all ages, five to eighty-years old; specially the youth inspired by Homay’s music and talent. During their 2008 U.S. and Canada Tour, The Ensemble preformed at some of the most renowned stages, including Walt Disney Concert Hall in Los Angeles, Strathmore in Washington, D.C. and Roy Thomson Hall in Toronto, Canada. The 2009 U.S. Tour will once again include venues such as Lincoln Center in New York City and of course Walt Disney Concert Hall in Los Angeles. Homay strives to collaborate with accomplished artists and musicians, both inside and outside of Iran and prides himself in always setting the bar higher in bringing innovation into his music, showcasing the Iranian classical music in the global world music scene, to gain the recognition it deserves. He has many other unique musical projects and collaborations in mind, which he hopes to bring to fruition, if permitted. Media inquiries are encouraged to further share the message of these talented artists globally, who have overcome many obstacles to be able to pursue their passion, and have traveled to the United States with the help of supporters of the Persian traditions and music. Sample of their music is available upon request. Founded in 2005 by Parvaz Homay, The Mastan Ensemble has become one of the most prominent traditional Persian music ensembles in Iran. Only in his twenties, Homay is an exceptional classical artist who composes, writes his own lyrics, sings and produces his music. His ensemble consists of eight highly proficient Iranian musicians. As their first U.S. performance, Homay and The Mastan Ensemble presented a sold-out concert at the Walt Disney Concert Hall on July 3, 2008, followed by many others in various U.S., Canadian and European cities. Homay, who follows the path of some of the greatest Iranian poets, writes poetry and lyrics that carry global political and social messaging of peace and harmony. Rhythmic, uplifting and mesmerizing, The Mastan Ensemble plays traditional Persian music in a way that has never been heard before. With an international reputation as a conductor and composer, Mr. Rohani is one of the most sought after, successful conductors on the music scene today. Educated at the Academy and Conservatories of Music in Vienna, Austria, Mr. Rohani has been the recipient of several important scholarships and awards both in Europe and United States. These include the A.K.M Scholarship, Vienna, Austria, and the ASCAP Scholarship, Los Angeles, California. Mr. Rohani is the music director and conductor of the COTA symphony orchestra in Los Angeles. He has appeared as a guest conductor with a number of prestigious orchestras including, the London Royal Philharmonic concert orchestra, Minnesota Symphony orchestra, Colorado Symphony, San Diego symphony, Indianapolis Symphony, New Jersey Symphony, Zagreb Philharmonic and the American Youth Symphony and others. Mr. Rohani conducted an open-air concert with the London Royal Philharmonic Concert Orchestra in the Parthenon, Athens, Greece. This concert was acclaimed by both critics and audience and became the most widely viewed program ever shown on Public Television in United States. Soleyman Vaseghi was born into a family with many generations of involvement with Sufism. He began his formal musical education by joining the Opera Choir at the Roudaki Opera Hall. He was introduced as "Soley" on National Iranian Radio and Television when he was a student of Sociology at the University of Tehran. He then began composing his own music. He also undertook extensive research in Persian literature, poetry, and different styles of music. Before he left Iran in 1986, he produced several albums in the so called "New Age" style albums for the international audience. This music was inspired by the teachings of Sufism and incorporated the poetry of the great Sufi masters, such as Rumi, Hafez, Roudaki, and Sohrab Sepehri. His albums, Vaghe (The Incident); Ab (The water), and Rangin-Kaman (The Rainbow) are the results of this journey. Soley joined the Lian Ensemble in 2002, initiating his involvement within the Persian Classical music. Homa Sarshar is a published author and an award-winning journalist, writer, media personality, and lecturer. She is the author of four books and the editor of twelve other volumes, including five volumes of the Iranian Women's Studies Foundation Journal, four volumes of The History of Contemporary Iranian Jews, and In the back alleys of exile book on tape. Her latest book Sha’ban Jafari was the number one bestseller Persian book in Iran and abroad in the year 2003. Throughout her 42-year career with Iranian print, radio, and television, Sarshar has done more than 1500 interviews and has produced and anchored as many radio and TV program. She has also produced a collection of twenty video documentaries on exiled Iranian writers, poets, and artists, some of which has been acquired by the Library of Congress. Sarshar has received numerous awards for her work, including the Medal for Special Achievement in Women's Rights, given by The Iranian Women's Organization of Tehran, Iran; Journalism Award: Distinguished Iranian Women by The Encyclopaedia Iranica, and Commendation for community affairs services by County of Los Angeles. Sarshar was born in Shiraz on 1946, raised in Tehran and earned a BA degree in French literature from Tehran University and a Masters Degree in journalism from the Annenberg School of Communications at the University of Southern California and an honorary Ph.D. degree in Journalism from American World University.